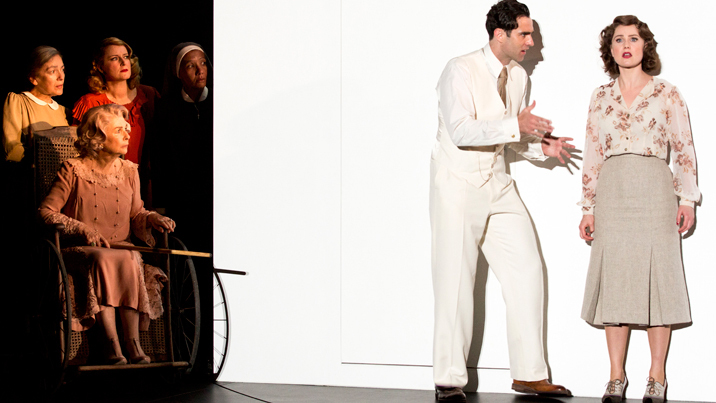 A perennial favourite with audiences, Elijah Moshinsky’s 1994 production neatly balances naturalism with theatricality. Created to an authentic scale, Michael’s Yeargen’s set designs are slightly dwarfed by the mighty State Theatre stage, yet retain vivid colour and detail at their core. Teeming with partygoers dressed in Peter J Hall’s opulent costumes, the crowded Parisian salons capture a sense of excitement and glamour that would be lost on a more capacious setting. The well-known opera covers the final months of celebrated courtesan Violetta Valéry, a woman clinging to life at a time when she should be in her prime. Finding love with ardent admirer Alfredo Germont, Violetta is robbed of her last chance at joy by the self-serving arguments of Alfredo’s protective father, Giorgio Germont. Working with a set of supporting players who are very well experienced in their roles, revival director Constantine Costi brings a lively sense of fun to the party scenes of acts one and two. 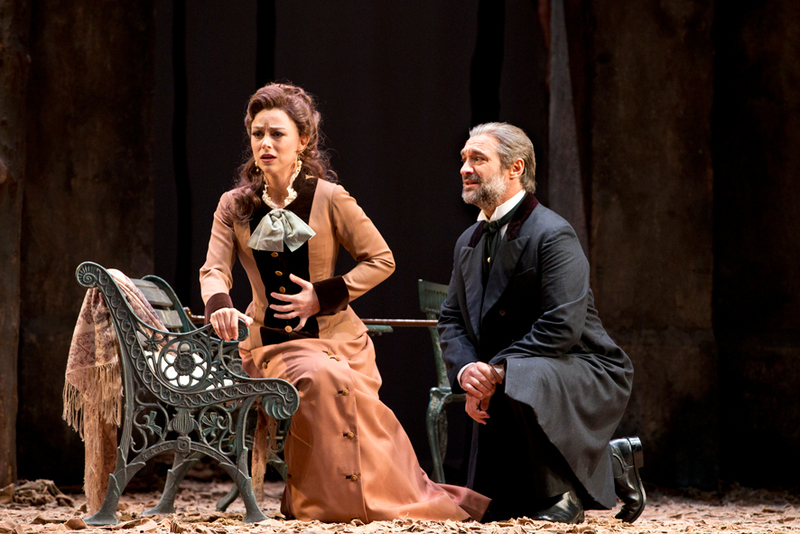 Stalwart mezzo-soprano Dominica Matthews is a vivacious presence as Flora. Powerful baritone Adrian Tamburini deftly crafts a memorable performance as jealous Baron Douphol. 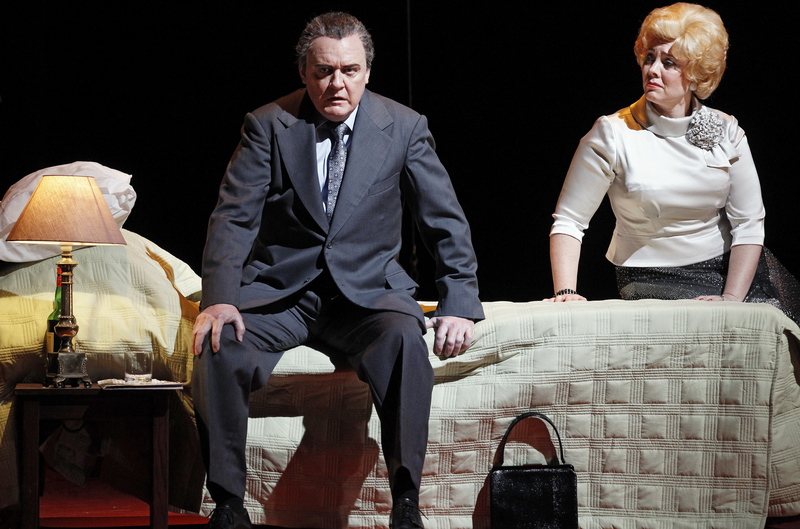 In a piece of luxury casting, highly capable soprano Natalie Aroyan gives sterling support as Violetta’s maid, Annina, moderating her vocal performance so as not to overshadow the lead singers and crafting a highly sympathetic characterisation. A distinctive aspect of this opening night performance derives from maestro Carlo Montanaro, a guest conductor of world renown. Clearly possessing intricate knowledge of Verdi’s score, Montanaro has the confidence to push Orchestra Victoria to noticeably rapid tempi throughout the opera. While there are times when this generates a sense of excitement, there are moments where the drama needs space to breathe. Poignant final duet “Parigi, o cara” is an example where more restraint was needed so as to bring out the full emotion contained in Verdi’s music. Rapid tempi also have the tendency to emphasise the oom-pah aspect of Verdi’s orchestrations. Under Montanaro’s baton, the venerable players of Orchestra Victoria show themselves to be fully capable of playing briskly, as do the fine singers of the Opera Australia Chorus. With reliably excellent preparation from chorus master Anthony Hunt, the Chorus impresses with their pinpoint dynamics and luscious tone. During all choral work, there is the very strong sense that the stage is filled with excellent singers; the company and the audience alike are well served by the abundant gifts of these performers. 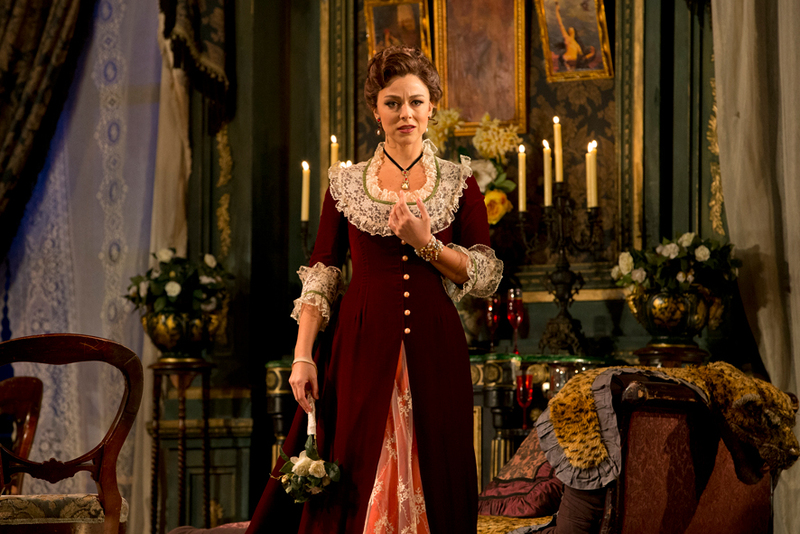 The current revival of La Traviata marks the Australian debut of rising American soprano Corinne Winters. The role of Violetta famously makes myriad requirements on the lead soprano. Winters seemed just slightly not quite at ease as act one began on opening night, but warmed in to the role beautifully as the evening progressed. The reckless abandon required for a thrilling “Sempre libera” may well continue to come forth as Winters’ comfort in the production increases. Winters’ coloratura work is pleasingly accurate, and while she is able to handle the pace put forth by Montanaro with relative ease, a decrease of some tempi would likely have given her more scope to really shine. Winters’ strength as an actress comes through in act two and continues into the final act. As Violetta lies distraught and dying, Winters comes into her full strength, giving a genuinely moving performance. Singing Violetta’s lament, “Addio, del passato,” Winters in full control and is seen and heard at her best. 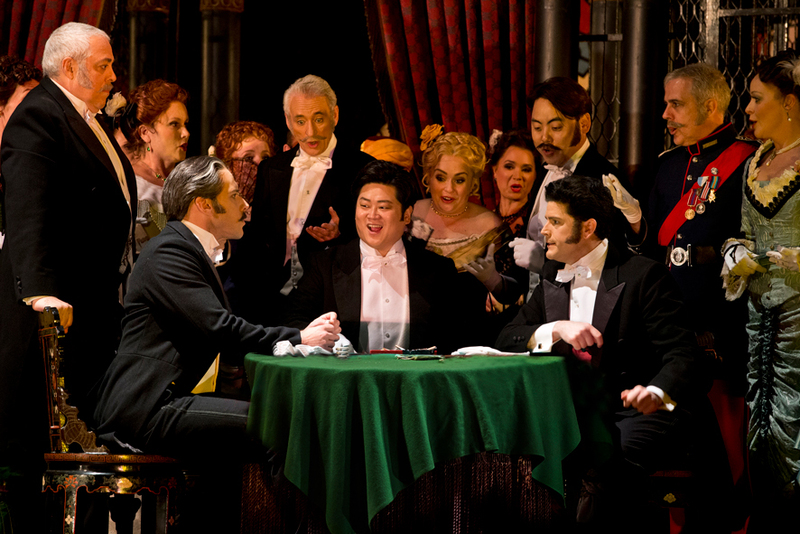 Korean tenor Yosep Kang makes a strong impression in the role of ardent lover, Alfredo. Kang’s youthful, clean cut appearance highlights the difference in lifestyle and personality of modest Alfredo and worldly Violetta. Kang sings with a confident, well supported tone, and his tenor has an edge of excitement to it. Kang takes full advantage of Alfredo’s opening act two aria “De’ miei bollenti spiriti” and cabaletta “O mio rimorso” as a showcase for his talent. Given that Violetta and Alfredo fall so quickly and passionately in love, it is unfortunate that Kang and Winters display little or no chemistry in act one. As the evening progresses, however, their individual performances take flight. 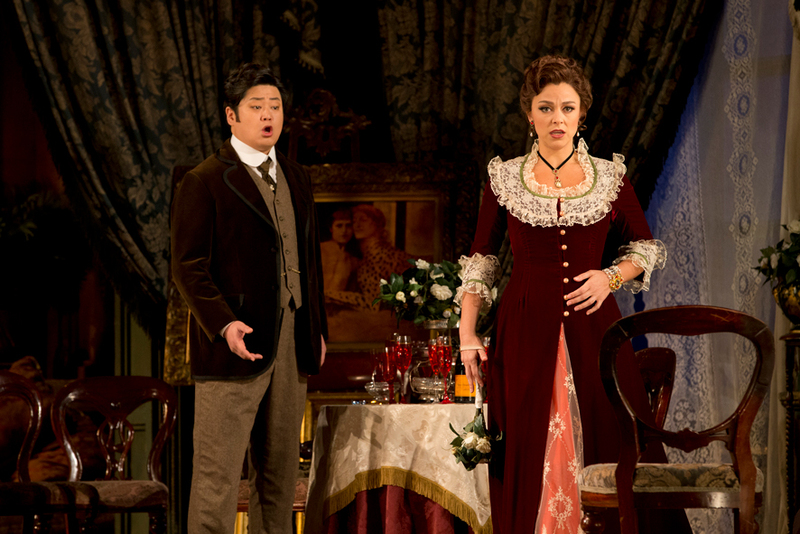 As Violetta and Alfredo feud bitterly and publically, the full company climax to act two sees Winters and Kang giving riveting performances. Veteran baritone José Carbó is an expert proponent of the role of stern patriarch Germont. Playing the character as more persuasive than forbidding, Carbó brings a humanistic warmth to a role that can often be played as unfeelingly cold. 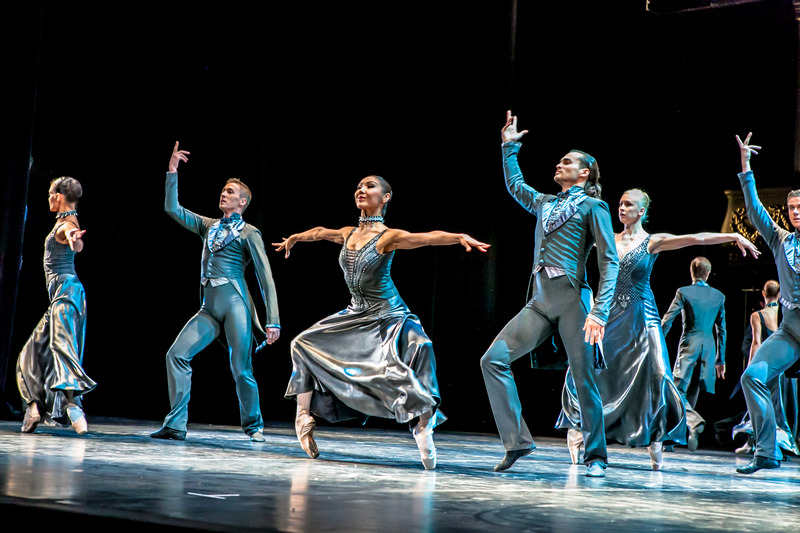 Carbó’s entrance in act two brings a palpable increase in performance energy, and both Winters and Kang lift in intensity opposite Carbó. Vocally, Carbó maintains smooth control, producing a gently burnished tone and imbuing his work with rich expression. As Germont attempts to comfort his son, Carbó’s rendition of “Di Provenza il mar” is a clear vocal highlight of the night. 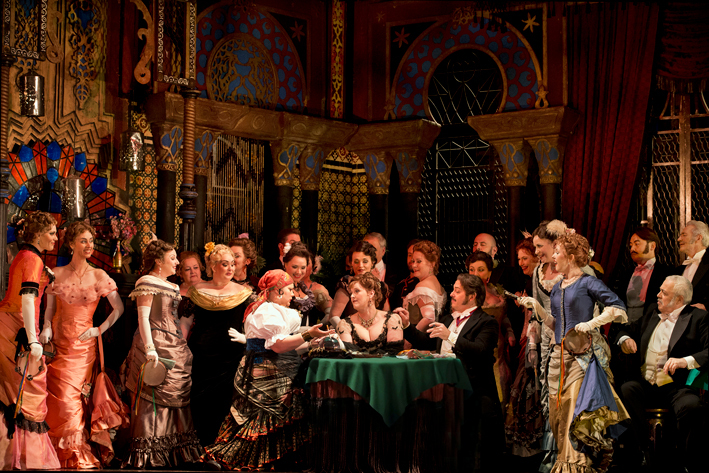 One of the canon’s most perfect operas for newcomers, La Traviata has the drama, pace, melody and glamour that characterise the very best of the opera world. La Traviata plays selected dates at State Theatre, Arts Centre Melbourne until 11 May 2018.